In prior versions of Rocrail the length of a train was only handled in the table of the locomotives. The length is important for automatic mode to make sure the train fits into a block completely (refer to settings of length of blocks in the chapter blocks). Controlling (function-) decoders in cars / trailers was only possible when they were created as a locomotive. As an example driving trailers with direction-depending changing front lights were set up as a consist with its leading locomotive. Locomotives and trailers are managed completely independent. Weight loaded and unloaded which can be used for Loco acceleration. On tab Operator Train random trailers can be assembled to the train using the Add button. By assigning a train to a locomotive a train compilation will be created. Basic functions like front light on/off or direction depending light changes are automatically synchronised by this assignment (especially locomotive with the driving trailer). Additional functions in the trailers may be controlled by actions or by using the throttle of a trailer. 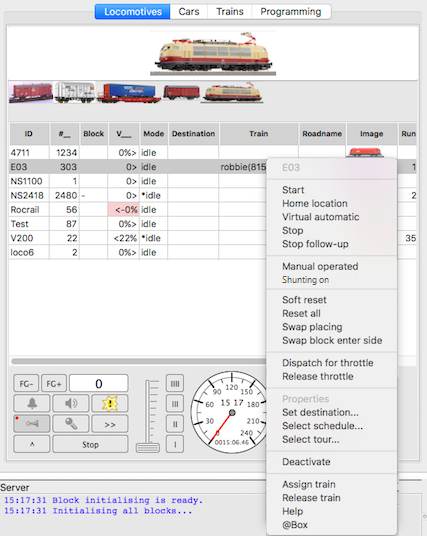 The length of a train compilation will be automatically calculated and shown in the column "train" in the loco table. To make sure that a train fits into a block, the sum of the parameters minimum train length in block + length of the loco + sum of all lengths of all trailers has to be less or equal to the block length. The values in all fields for the length parameters are integer. By using values in cm the complete length of a train may be not exact enough in case of using long trains. Rocrail is only comparing values, not dimensions. Therefore the dimension can be freely chosen( regardless other statements). The assigned Train its locality will be automatically updated if the Loco arrives in a block. After releasing this train from the loco it still remains in that block which is visualized as shown in the next paragraph. A block with unassigned train/cars can only be used as loco destination if this block is set to Shunting.